Islamic principles on business, banking and finance constitute one of the most confused branches of shariah knowledge in the modern world. This is aggravated by the fact that many who write and speak on this subject are doing so from a perspective other than Islam. For instance, many of the proponents of Islamic banking and finance are actually non-Muslims. These include top finance professionals as well as researchers in prestigious universities like Cambridge (see article). Regardless of what others say about Islamic finance and what their motives may be, we as Muslims must be clear about what the Islamic principles are on business, banking and finance. Moreover, this should not be limited to knowing the shariah rulings but also how these rulings fit within the wider ethics, objectives and principles of Islam. The forthcoming seminar, "Islamic Banking & Finance - A Myth or A Reality?" takes a fresh look at this branch of shariah knowledge, including the fundamentals - its foundations, principles and applications in everyday life, and also a comparative look in light of this at prevalent banking and finance practices, both Islamic and conventional. This is a seminar which is relevant and essential not only for scholars, students, finance professionals and businesspeople but for any one of us who is involved in even everyday matters of finance. 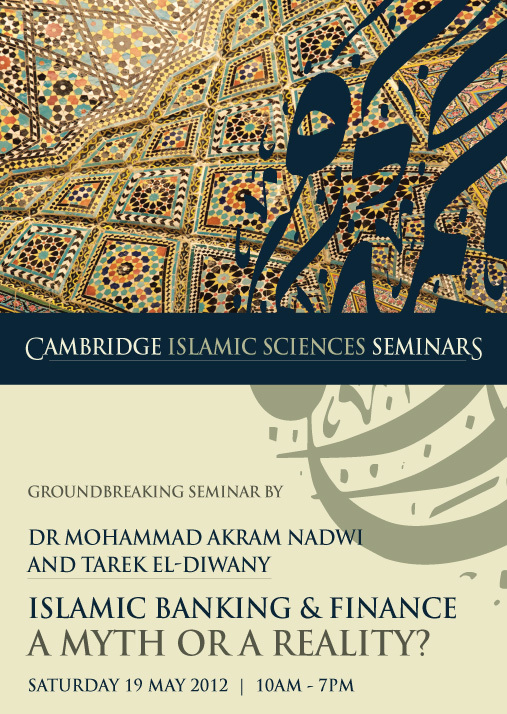 This is the first seminar of its kind by one of the leading western Islamic scholars and researchers - Shaykh Dr Mohammed Akram Nadwi of The Oxford Centre for Islamic Studies, Oxford University and Tarek El Diwany, author of The Problem With Interest and contributing editor of Islamic Banking and Finance: What It Is and What It Could Be. Islamic Finance & Banking - A Myth or A Reality? Islamic Banking & Finance - A Myth or A Reality?